The Cooper Collection by Catnapper offers Power Lay Flat Reclining Mechanism with Power Headrest and Comfort Control Panel Technology. This collection is upholstered in Luxuriously Soft Chenille Fabric available in two colors: chocolate or stone. "Carefree Casual" Pillowtop Seating will cradle you in comfort while the correlating toss pillows add style and finishing touch. Loveseat additionally is provided with storage console and cupholders for maximum convenience. 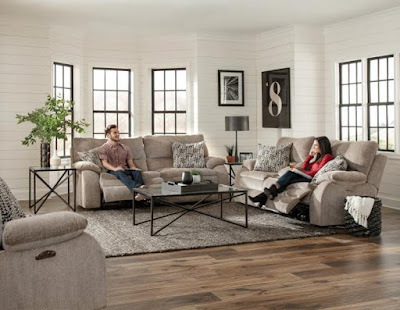 This Set includes Power Headrest Power Lay Flat Reclining Sofa and Power Headrest Power Lay Flat Reclining Console Loveseat with Storage and Cupholders. Matching Power Headrest Power Lay Flat Recliner is available as an option. * Recliner comes without accent pillow. To see the entire Cooper Collection click here.